The Superiority of Jesus over Mohammed. What a difference between Muhammad and Allah. Did either love sinful creatures as our Lord Jesus Christ? This is brought out beautifully in The Belgic Confession, Article 26: About the Intercession of our Lord Jesus Christ. Does Muhammad love like this? Does the God of Islam, Allah, love like this? Did Allah come down to lay his life down for sinners. Not at all! Allah is removed from his creatures and cannot enter into our world. Muhammad, himself a sinner cannot provide salvation for anyone as he is a sinner also in need of salvation. Sinners will not find absolution, the forgiveness of sins or peace with God through Mohammed but they may certainly find it through the Lord Jesus Christ. What are we to say? Can Mohammed save? Did Mohammed die in the place of his followers? Does Mohammed intercede for sinners? Mohammed only left rules and regulations. Jesus kept the law of God perfectly and then died in the place of sinners. ‘In my place condemned He stood, sealed my pardon with His blood’! Full atonement! – can it be? Philip Paul Bliss, 1838 – 76. Version in Christian Hymns (1978) No, 221. It’s worth comparing, so here’s a link to three articles hosted by the Islamic site The Religion of Islam about salvation. All three are together in This Link. Dr James White is keen to get his recent debates in South Africa circulated as widely as possible. If you are a Muslim visiting this page please listen and watch the debate. James White and Yusuf Ismail debate the Christology of the Gospel of John, and then the Christology of the Qur’an, in an historic debate in the famous Grey Street Mosque in Durban, South Africa, the home mosque of the late Ahmed Deedat. Here’s the debate on Crucifixion or Crucifiction. Cranmer: Canon Andrew White: “You have got to be prepared to die for your faith”. Saw this on BBC ‘Newsnight’ last evening. Andrew White tells it like it is – Dreadful. Very sobering reading from Cranmer. He is right, Christians do seem to be sidelined. Cranmer: Canon Andrew White deserves a knighthood. Canon Andrew White is known as ‘The Vicar of Baghdad’. This post by Cranmer makes for very Sober & Prayerful reading. Iraq crisis: British jihadi fighting for Isis in Syria was ‘radicalised by imam at Coventry mosque’, father says – Home News – UK – The Independent. Confirming these news stories, I have it on good authority that an Iman in Coventry in sending young men out to Lebanon for training in Jihad. But apparently the same Iman is making sure his own sons go to university. BBC News – How do you define Islamist extremism? BBC News – How do you define Islamist extremism?. Today, the government defines extremism as “vocal or active opposition to fundamental British values, including democracy, the rule of law, individual liberty and mutual respect and tolerance of different faiths and beliefs”. Off the top of my head that definition probably needs working through. Governments publish these definitions without realising how it could be used. For example (can’t remember the exact words) yesterday on Radio 4’s Today programme David Blunkett (MP) was interviewed about the same issue but included in his description of extremism ‘Crazy Creationists’. How he would describe a Creationist is not known but the point is this definition will (I hope and pray it won’t) be used to go after Christians that believe the Bible – how crazy is that! I’ve started listening to The Janet Mefford Show, downloading (Available through iPlayer) to listen on the way to work. I listened for the first time to Dr Oliphint (Covenantal Apologetics) on the show and was pretty shocked by some of the other stuff – particularly the Homosexual ideology and Islam. I was a bit skeptical to begin with, the concern was if Janet was a fundamentalist nutcase. Some of her callers gave me that impression. But I have to say she has some excellent guests and to be honest I now lament afresh the fact there is nothing like it over here in the UK. It would probably be shut down over here as a show that promotes hate speech – even though that’s far from the truth. Disagreement is becoming more and more problematic. I heard via another online broadcaster (not Janet) the term ‘Gaystapo’ for the first time to describe the Homosexual lobby / agenda / ideology. Whilst the term may not be that helpful I think we get the point. Basically, disagree and expect to be dealt with. And it’s really no different when it comes to Islam. The cry of Islamophobe is fairly common here – we had it from the BBC Question Time audience just last Thursday – compete with (measured) applause. Radical Islam In the House exposes the very real Islamist threat to America. It’s no longer lurking at America’s door, it has already penetrated deeply into the federal government and our culture. The over arching goal of the leadership of every major Islamic sect is to create a global Caliphate or world government. Iran wants to create world chaos to allow the Shi’ite Muslims to form a Shia Caliphate. While allowing Iran to obtain the nuclear bomb will be catastrophic, there is an equally dangerous Islamist cancer that is systematically Islamizing American politics and culture; Wahhabi Islam. Saudi Arabia’s Wahhabi Islam is the foundation of al Qaeda and the Muslim Brotherhood. Al Qaeda uses violence, while the Muslim Brotherhood uses stealth and deception. By preying on political correctness, they have convinced most Americans they are peaceful, share the same God and want to coexist. While peaceful coexistence may be what the average Muslim wants, it is not true of the Islamic Brotherhood leadership. 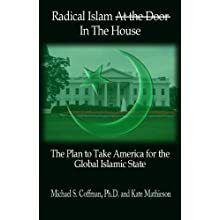 The Brotherhood has a well-developed, step-by-step plan to turn America into an Islamic controlled nation within a few years as part of their world Caliphate. Nearly all Muslims believe that the return of the Mahdi, their messiah, is eminent. When that happens he will lead Islam into global conquest and a global Caliphate. This story quite literally leaps off the pages of the Bible in ways non-Jews, Christians and even Muslims will find shocking. Very few Americans know that Obama’s Kenyan family is steeped in Wahhabi Islam, or that prior to the 2008 election Egyptian TV and radio bragged that a Muslim was going to be president. The implications are stunning and should be understood by everyone — before it is too late.